Memebox Giveaway September 2014! 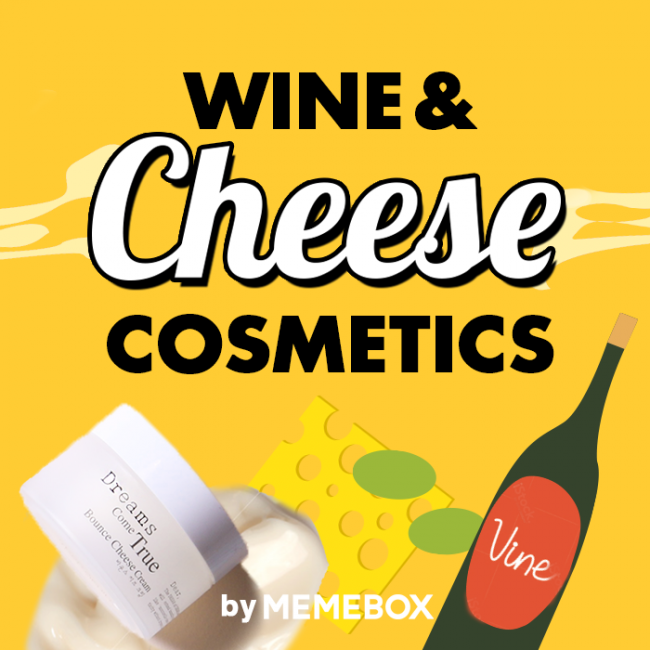 Your Choice of Wine and Cheese Cosmetics OR Super Luckybox #11!! OPEN INTERNATIONALLY WHERE MEMEBOX SHIPS! Memebox (pronounced me me box) is a great way to get new and interesting Korean skincare and beauty products. This is not a subscription box, you can buy as many as you choose and you will know the general theme surrounding the box. You won't know what's in it until you get it, though! Memebox sends you the most trusted, best-loved Korean beauty products in each of their boxes. Korean skincare products are renowned for their quality and innovative technologies. So you are getting the cutting edge of skincare delivered to your door. I've been really happy with what I've received so far. Superbox was inspired by Memebox lovers, looking for full-sized products catered to specific needs. Each Superbox series comes with it's own theme, designed to target particular concerns. Luckybox was created to bring back the most popular items selected from previously sold-out Memeboxes, all combined in one wonderful collection. Each Luckybox contains a selection of products from past Memeboxes, and occasionally will include a new favorite. Today's Giveaway is for ONE of two Memeboxes! The winner will get to CHOOSE which box they would like to receive! 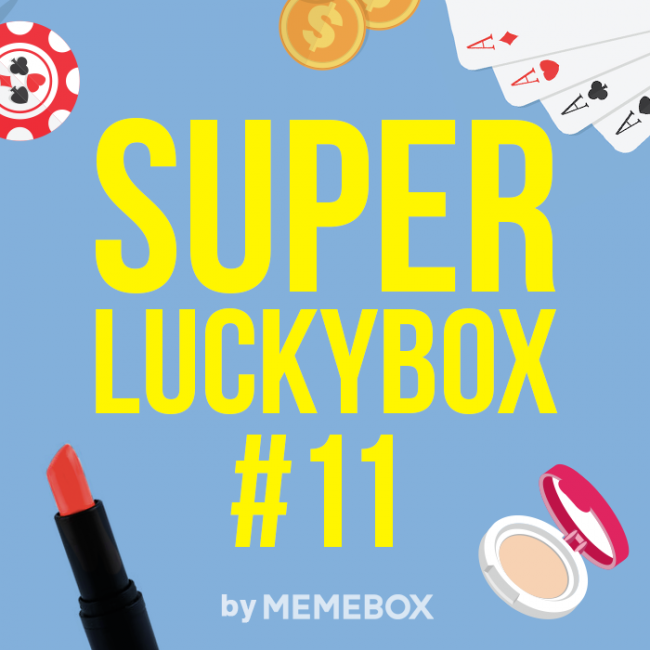 Memebox is back with a Super Luckybox #11! This is also the first Super Luckybox ever! Packed with only our best-selling and top-rated beauty goodies in all of our history, this box will surely make you a Memebox believer! Wine and cheese have gone hand in hand for centuries, but this is probably the first time you’ve seen a wine and cheese beauty box. Leave it to Memebox to cook up the weirdest, yummiest beauty box that will amplify your beauty! Wine, famously known to be rich in antioxidants and essential minerals, speeds up the cell renewal process and stimulates the blood circulation for the look of rejuvenated, brighter skin! Cheese, considered an excellent source of Vitamin B for the skin. supports the look of supple, bouncy and glowing skin. *Plus, here’s a spoiler! Bouncify your skin with a FULL SIZED Memebox cult classic Dear by Enprani’s Dreams Come True Bounce Cheese Cream! This innovative facial cream has a unique ooey-gooey, bouncy texture that comes from a high concentration of protein-rich whey. The fun melted mozzarella cheese texture will adhere to the skin perfectly, and hydrate and firm the skin for the plumpest, youngest cheeks ever! *In order to receive your prize, you must have an account with Memebox. The winners Memebox account email, name, phone number and address will be needed in order for Memebox to send you your prize. *This giveaway is sponsored solely by Bits and Boxes. There will be one (1) winner. The winner will choose which box they would like from a) Memebox Super Luckybox #11 or b) Memebox Wine and Cheese Cosmetics. Please note: Deliveries may be subject to additional fees such as import taxes or customs duties. Memebox can not determine and is not responsible for any additional charges apart from such additional fees. It is highly recommended to contact local customs offices to request estimates of customs duties according to the delivery to your determined country. *Please enter responsibly and adhere to the rules. All winning entries will be verified. Rules subject to change without notice. *Winner must respond within 36 hours or another winner will be chosen. Me too! Does it have more items, are they all full size?! I've been wondering! I would like the Super Lucky Box for the same reasons, but also because it seems to be of products people love. I would want the wine and cheese. I thought really hard about buying it, but decided to wait it out for an unboxing. It really is. It just looks so neat! I'd choose Wine and Cheese for a little indulgence. Me too. I think Wine & Cheese is going to be awesome. I am really curious to know why it's super! I would choose the Super Luckybox #11 for the surprise. Super Luckybox #11, FINGERS CROSSED! Luckyboxes are one of my favorite boxes just because they tend to have such good things in them! I'd go with the Wine and Cheese superbox because I still haven't tried the bounce cream. It's so hard to choose between the two! On one hand, we have a box that will contain awesome, much loved products, while the other contains Bounce Cheese Cream (which I'd been wanting to get for a few months now)! I think, ultimately, I will go for the more mysterious side of the lucky box! Wine and Cheese for the Enprani Bounce Cheese Cream. I'm considering buying that so if I win I'll choose the Super Lucky Box so I can have both ! Addicted much LOL. I'm totally addicted, too, so I'm right there with you! Anna, I think you are right! The Super Luckybox would be perfect! Jennifer, yes, I also have been wondering why it's super! Tanks for giveaway! Hope I win! Wine and cheese - sounds yummy! Super Lucky Box because I'm super curious about the contents! I've also been wondering if it's going to be in there! Maybe that's why it's super? Super Box definitely because I know those are usually in general good whilst I know themed boxes can be hit and miss in terms of what you get. Though the wine and cheese box does sound really interesting! I do agree with you on this. Global boxes and Luckyboxes tend to always be great! Wine and cheese box... Because I actually bought the super lucky box #11 for myself! I'd go for the super lucky box! I've ordered "regular" lucky boxes before and all of them were really good! I'd probably choose the super lucky box if I won because I couldn't resist ordering wine and cheese already. Thanks for the giveaway! I would love to get the super luckybox. I have been meaning to try it! If I was to win, I would choose the Super Luckybox #11 because I fear what type of products they would put into the Wine & Cheese Box after reading your review on the weird products you received in your memeboxes. Cheese box sounds very interesting but the lucky box sounds even better! I would choose the Wine and Cheese box. I would choose Wine and Cheese! Thanks so much for the giveaway! I would choose Lucky Superbox #11 if I won! I hope I win the super lucky box! I would chose wine and cheese, every one is raving about that cream! The super lucky box! I already have the cheese cream, and i like it but i think my skin will get used to it by the time I'll finish it, so id definitely choose luckybox! I cant wait to see whats inside! I would love to win the Super Luckybox, because I want to know why it's a Superbox rather than a normal Luckybox. I didn't really like the Bounce Cheese Cream (actually cheese in general), so the Super Luckybox would be a better bet for me!! Thanks for the giveaway!!! I hope you are right! All full size products would be fantastic. I don't know what they could put in the wine and cheese box beyond the cheese cream and maybe the SkinFactory Wine 7 Seconds Morning Sheets (which are great). But I didn't know what they could put in the Milk box either and that was a fun box. I'm excited to find out what's in both of these! Super Lucky Box 11 for me, since I already have Wine and Cheese on order. I'd like the wine and cheese box! I would have to go with super lucky box! I love all things memebox! I would probably go with the lucky box because if won, well, how lucky, right? Oh I wanted to buy the lucky box~ thank you for the great giveaway! I wanted Wine and cheese box. I think I would pick the Super Lucky Box just because I have so many themed ones already--I would love to test more new stuff! Of course, there's more than enough time to be indecisive. Thanks for the great opportunity! Probably wine and cheese cosmetics! I want skincare and not as much makeup anymore. Of course, I might want the super luckybox instead in a week! I would pick the Super Luckybox because I've ordered the Wine and Cheese box already! I'm really interested in Memebox Super Luckybox #11! I would love to receive any of them. I don't ordered any of them. Been wanting to try memebox for so long, I would like to choose the Super Lucky Box 11 seems like the bomb! Oh, hard choice. I like the luckyboxes quite a bit, but that Bounce Cheese Cream calls to me, so I think Wine and Cheese wins out. I'm really excited about the Super Luckybox! I would to try the super lucky box because I haven't tried one yet! Ooo!! Another good wine-related idea! I'd love to get the Wine and Cheese box because I like skin care products more than makeup and I think W&C is more likely to have less. Also, bounce cheese cream! I think you are probably right about that. I prefer skincare, too! I would love to try the wince and cheese because I want to see why people love the bounce cheese cream so much! I would love to try the wine and cheese box because I have never tried products with those ingredients before! I'm going to have to say the Super Luckybox 11, only because I'm concerned about what could possibly be considered the wine portion of the wine and cheese box. Though the bounce cheese cream does sound appealing. I'm thinking they might use products with Resveratrol in it but I don't know for sure. I'm also wondering if the Bounce Cheese Cream will be in the Super Luckybox! Super Luckybox #11 sounds like it would have a wide array of products.. best selling, top rated and a superbox! I am really curious about the Super Lucky Box buuut I would pick the Wine & Cheese box because it seems so intruiging as to what it would have - plus i think it will be more skincare than the Super Lucky Box! I loooooove this giveaway! Thank you for the chance! I would pick the Super Lucky Box. I'm curious - what makes it super?! I'd choose the Super Luckybox! It sounds like it would have a lot of great products! Super Lucky Box because I'm curious! I bet there will be some good things in there. Plus the Wine and Cheese thing just doesn't interest me much. The wine and cheese box only because I think I already ordered the super lucky box. I so want the Super Lucky Box. I've bought the wine and cheese, let's hope it's great! Thanks for the giveaway! I already have the Wine and Cheese coming, but didn't spring for the Super Lucky Box. I totally understand! Good luck! I'd love to get the wine and cheese box. I've read some really positive reviews of the bounce cheese cream and would love to give it a try. I am so curious about the Lucky box #11. I would want it if I am lucky enough. I would totally love to have the Super Luckybox #11! I would love to be surprised by the Super Lucky Box xoxo. If I won I'd go for the Super Lucky Box, but only because I already bought Wine & Cheese. I bought some actual wine & cheese too. I've never won one either but I always try just in case! I never had a Memebox before, I'm fascinated. They sound pretty cool! They both seem really great! I think I would like the Super Luckybox the best. However, the Wine and cheese one sounds so good. WINE AND CHEESE BOX!!!! I've wanted this box since it first came out but unfortunately i've had to cut myself off from Memebox because i've been spending wayyy too much money lol! But i want this box sooo bad!!! It's way too easy to buy a Memebox, isn't it?! The best ones are free!! Good luck! Ooh, I've been eyeing both of those boxes! Wine and cheese interests me! Thanks for chance an awesome giveaway! I have a heavy meme addiction, my wallet cries often. I would get the Super Lucky box. I've never tried a lucky box before. I'd love either box but the Super Lucky box would be my first choice. Feeling lucky about the lucky box!!! Thank you for doing the giveaway!!! Must! Have! Super! Lucky Box! I'd love the Super Lucky Box! I'm so curious as to what's in it!! Wine and Cheese sounds awesome! The wine and cheese box is definitely my choice. I've read only positive review of the bounce cheese cream and I'd love to try that one. Wine and cheese is deffinately awsome! Wine and Cheese Box for sure!